This is Birba in her "cone of shame": she had an extra set of declaws and needed to be removed. Although she is doing better than expected (she is the least tolerant of the pack), she'll be pretty happy once that cone that make her look like a lamp will be removed. The idea was to put an inflatable collar on her (which are more comfortable and less stressful), but she was still able to reach her back paws. So we ended up with the E-collar (Elizabethan collar)... and after the initial stage of craziness, she is now coping with it much better! ... She'll have it removed on Friday!! Love love love this post! I feel bad for Birba, but you put a huge smile on my face. Also, if my dog swallows another plastic something, this tutorial may come in handy (anything animal related is SO expensive in the US!). haha! 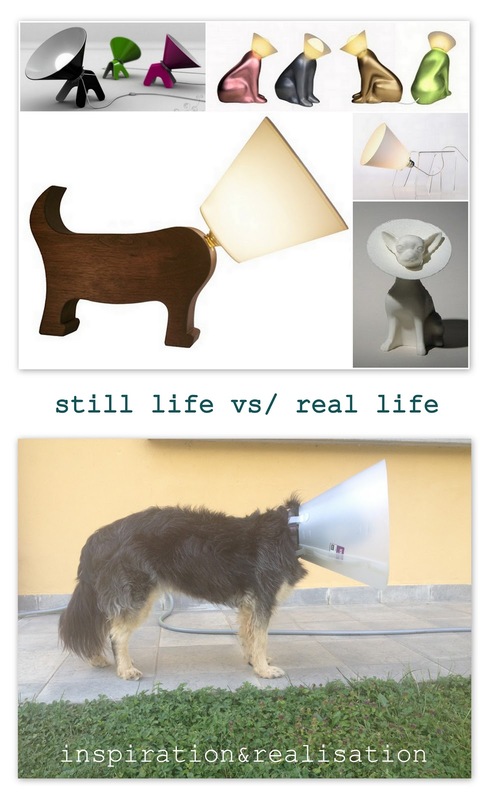 The cone of shame is so sad, but i love those lamps! And getting the dew claws off are worth it! thank you so much!!! hope you enjoying hanging out here!!! D.